Model T Ford Forum: What kind of door linings on '25 touring? What kind of door linings on '25 touring? Model T Ford Forum: Forum 2018: What kind of door linings on '25 touring? I am looking to replace all the interior linings on my '25 touring, which appear to be currently made of a thick card like material, not quite MDF, more a very thick cardboard, but not the corrugated kind. Does anyone know the correct door lining material for a '25 touring? I think both Classtique and Cartouch are covering the heavy card with the same stuff as the seats are covered with (they even sew it onto the card so it doesn't get loose and the backing fall off inside your door)...so you could probably just buy those from one of them and save yourself some hassle of making them yourself, besides they're cheap(er) than trying to do it yourself also. My 21 Touring has no inner door panels. I was given a set for a Model A with the car when we bought it. I sold them. People are amazed when they see the great shape of the original wood in the doors on our car. I probably won't put ANY panels on it. Not anytime soon anyway. 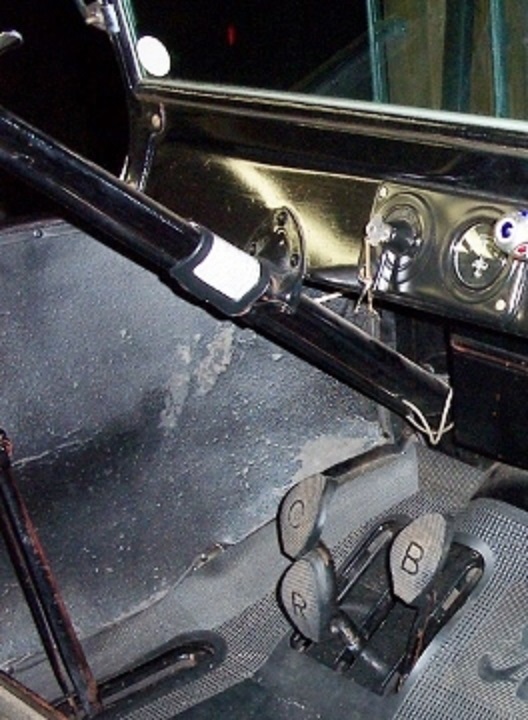 Original driver's side kick panel. A cardboard with a glossy like surface, hint of grain coarse like graining. Most use std. black dull finish waterproof cardboard upholstery stock. Tacked on with welting around the wood backed edges. Get yours from Classtique. Car Touche has a bad reputation. It would be nice if someone with lots of money could have the Ford carboard reproduced. I have a NOS door insert, and it doesn't look like anything they make today.